I think that I have discovered my perfect Fall outfit. 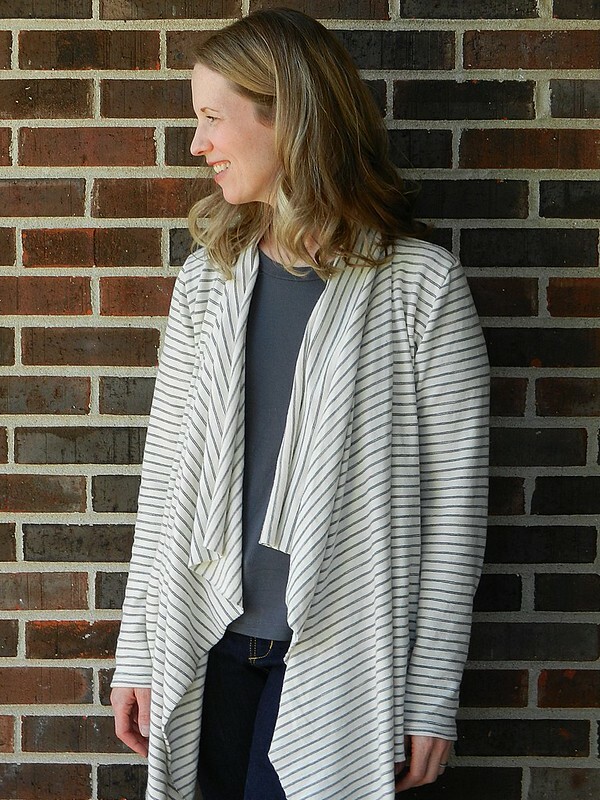 I have had my eye on the Straight Stitch Designs Laurelhurst Cardigan for a while, but never got around to making it. 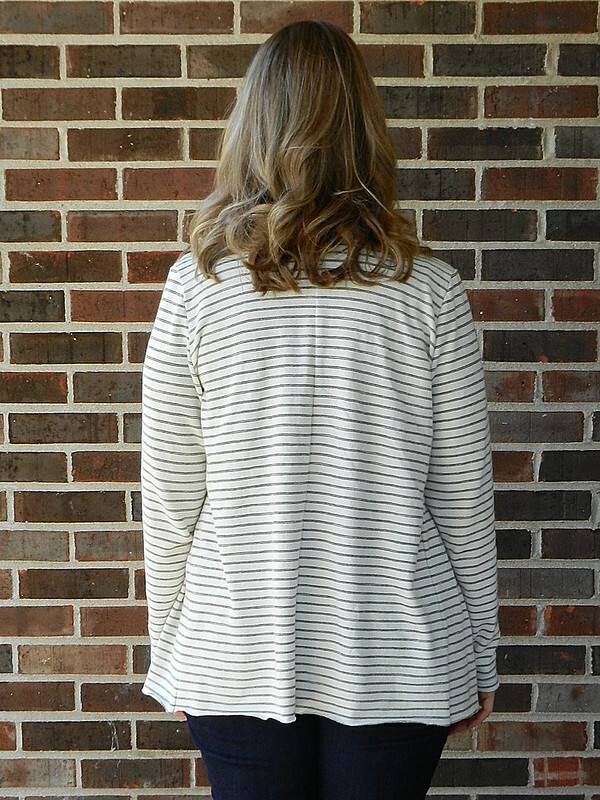 When I saw this version from the Indiesew Fall Collection I knew that I wanted to make a Laurelhurst right away. And not just any Laurelhurst… I wanted to make that exact one. The fabric looked so cozy and perfect for Fall weather, so I ordered some the same day. We were having cooler temperatures when I ordered the fabric, but by the time it came (only 2 or 3 days later) the temperatures were back in the 90s and I wasn’t feeling like snuggling up in a big, blankety cardigan anymore. Thankfully the heat wave has passed so I got my pattern from Indiesew and got to sewing. The fabric I used is from the Indiesew shop, but it is now out of stock. It’s a little bit more of a sweater knit feeling than the knits that I usually use and it is really soft. 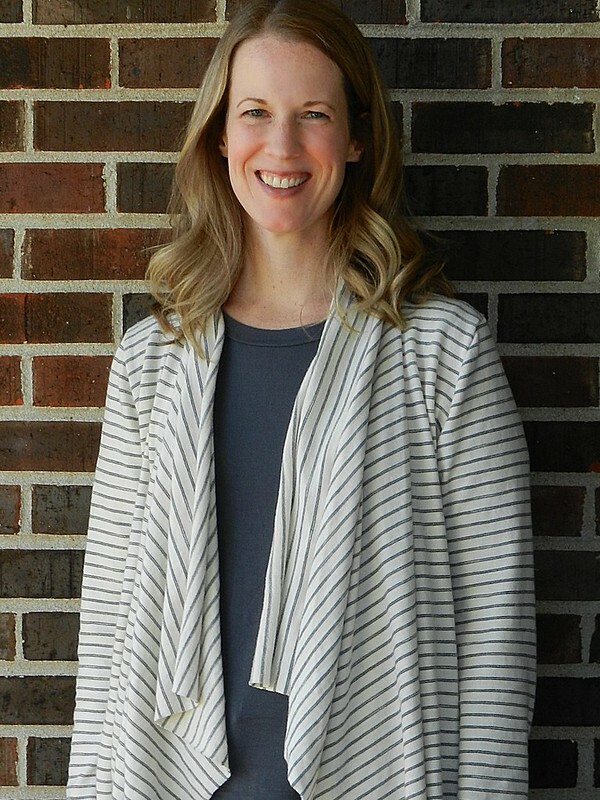 I love the charcoal gray stripes and they go really well with my rayon jersey Union St tee. I added my Ginger Jeans and I have a really comfortable, all handmade outfit! The Laurelhurst is sizing is solely based on bust measurement since it’s drapey and loose. I went with a size 10 and did grade out to a 14 at the hips just because that is what I’ve done with the other Straight Stitch Designs patterns that I’ve made. I don’t know if grading out was totally necessary but I felt like it was better to be safe than sorry. The cardigan is designed to have all raw edges but I decided to hem the sleeves. I think I will be OK with rolled up edges on the front and bottom, but I had a feeling that curled up edges on the sleeves would drive me nuts. I didn’t add any length to the sleeves and did a 3/4″ turned up hem. The sleeves are still nice and long, which I really like. This is a quick, fun project. It took me just a few hours and would have taken quite a bit less if I hadn’t had to do so much stripe matching. It’s a great, easy layer to throw on but looks way more polished than my worn out hooded sweatshirts. I’m thinking a basic black version may be next on the list! p.s. 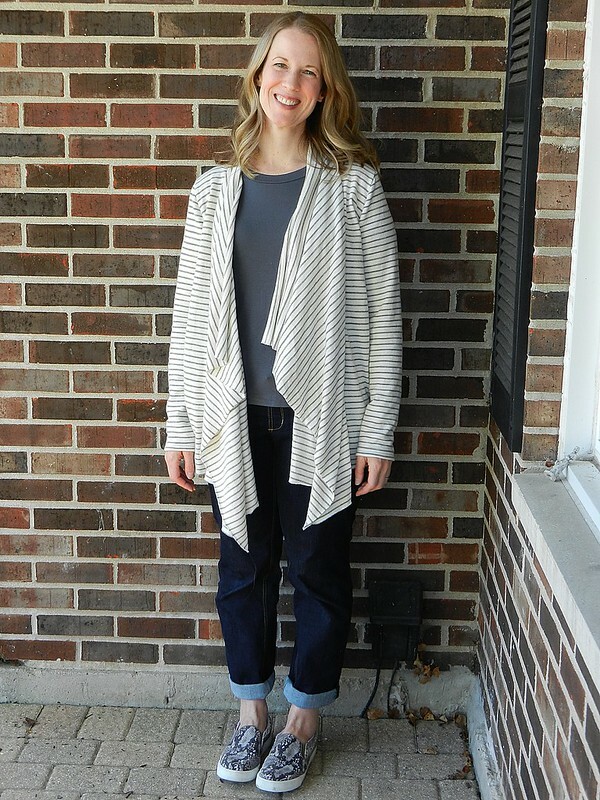 As part of the Indiesew blogger team I was provided with the Laurelhurst pattern. All opinions are my own. Next Post Momiform MAKEover Series and a Giveaway! Thanks, Valerie! I am really happy with how it turned out! This is a great handmade outfit, Teri! 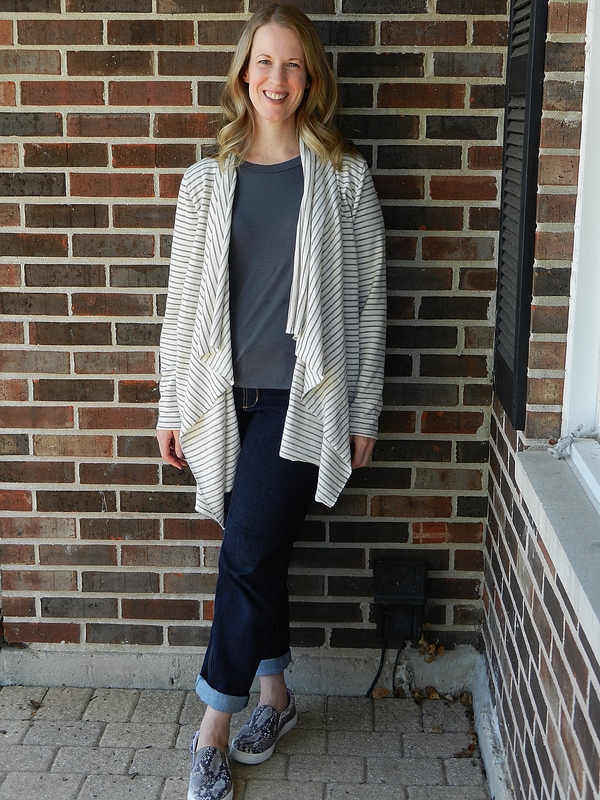 Wishing I got cooler temperatures just so I can make that cardigan! Thank you, Fiona! As much as I dislike our brutal winters, I do love the after Summer cool off. 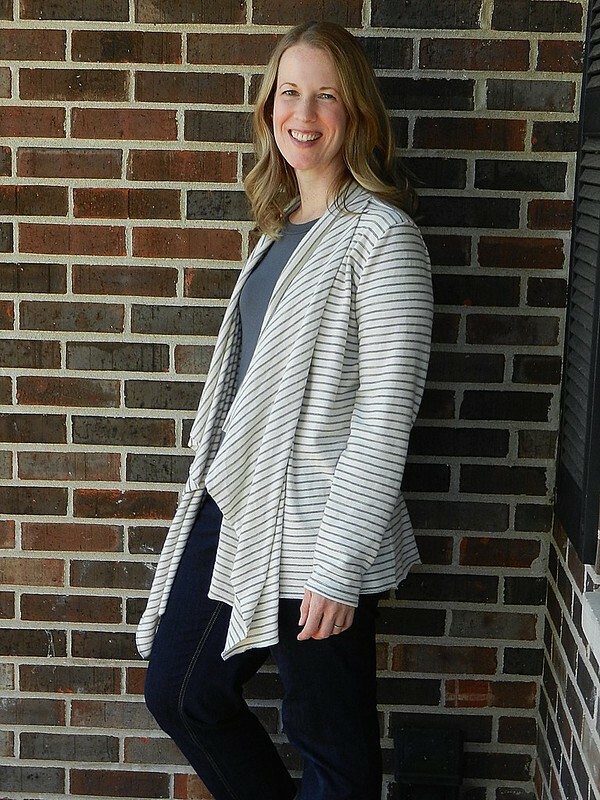 I bet you’d really like this cardigan– maybe in a tissue weight knit! This looks great, and super snuggly! Thanks, Heather! It really is snuggly! We are supposed to have cooler temps this week so I’m sure I’ll be throwing it on quite a bit! Very impressed with your all hand-made outfit! Love the cardigan. The striped knit sounds very cozy. Thanks, Noelle! I know I’ll be coming back to this pattern soon. It’s such a great layering piece! Thank you, Teresa! I did actually force myself to take it off eventually but I’ll be wearing it again soon! I have been wearing sandals and flip flops all summer and it feels good to pull out some old favorite shoes again! I love that this entire outfit is handmade! The cardigan looks super comfortable and will hopefully get a lot of wear this fall/winter. It looks perfect for just throwing on when you catch a chill. Thanks, Carolyn! I think this cardigan will really fill a hole in my fall wardrobe. I often end up wearing my husband’s zip hoodies when I am outside with the kids. They are way too big and sloppy. I think now I can grab this instead and play outside in style! I love the whole home made look, some great work there, you certainly wouldn’t know it was all hand made just by looks. The cardgan looks super snuggly. Thanks, Jenny! Having completely handmade outfits is such a great feeling!